About half the Four Suit Spider solitaire games are winnable. The key to winning Spider games is to be able to create spaces in the tableau. Spaces allow the player to get cards of the same suit together and to untangle the layout. The columns where spaces might be created must be kept as short as possible while other columns especially the columns having kings can be kept long. Order in which card building should occur. Build cards on cards of the same suit. Build with cards that can be built on more than one card. Build on cards that can have the most cards built upon them. Build on columns where it is unlikely that a facedown card could be uncovered. Build on cards that are on the longest columns. Build on cards with the highest ranks. It is not always good to build cards. It might be good to not to move cards that are on columns where creating a space in the near future is impossible. If a card covers a king or a complex sequence of cards, you might not want to build with that card if the building means decreasing the probablity of getting a space elsewhere. Fill spaces with cards that have a good chance of being picked up again and thus create a space. If you are playing Spider with the Solitaire Games of Skill program, check the table to see the number of cards for each rank that are not faceup. Try to fill spaces with cards for which there are a large number of cards one rank above that are not yet faceup and thus are likely to appear in the next deal. The cards one rank above could be used to pickup the card you are using to fill a space. For example in the screenshot below, it is tempting to fill the space with the six of spades in column eight and thus uncover a facedown card. But according to the table there would be only a 36% chance that play would continue if the six were placed in the space. A better strategy would be to fill the space with a card which would have a good chance of being picked up again and thus create a space on the next deal. Of the cards available to fill the space the eight of hearts in column two has the largest number of hidden cards that are one rank above according to the table. Thus it might be good to fill the space in the screenshot with the eight of hearts so that one of the four hidden nines might be used to pick up the eight and thus create a space on the next deal. Alternatively fill spaces with cards that can be built back on a column or columns of the present tableau. For example in the screenshot below the seven of clubs in column nine would be a good card to fill the space. The eights in columns two, seven, and nine might be used to pick up the seven and create a space on the next deal. It might be thought that using the table is cheating, but the Solitaire Games of Skill table could be created by the player based on the cards already faceup. Sometimes it is better not to uncover a facedown card if it means filling a space by a card. If when the facedown card is turned over it is likely that there are no further moves, it would be better not to uncover the facedown card if it means filling a space with a card that has a poor probability of being picked up on the next deal. Instead you should leave the facedown card covered and fill the space with a card that has a good chance of being picked up to make a space on the next deal. The probability that turning over a facedown card will result in further moves is given in the Solitaire Games of Skill program table. The player could also calculate this probability by hand based on the visible faceup cards. When many of the columns are topped with aces, the probability of further moves being created by uncovering a facedown card is usually poor. For example in the screenshot above the probablity of further moves in the screenshot above is a low 29% with several columns topped with aces. Thus instead of uncovering a facedown card in column one by placing the king in column one into the space, it would be better to fill the space with a card that has a high probablity of being picked up again and go on to the next deal. Whenever possible try to get cards of the same suit together. The game could be lost if one such opportunity is missed even if it requires 20 or 30 separate moves just to get two cards of the same suit together. The Solitaire Games of Skill program allows the player to swap columns and thus accomplish in one move what would ordinarily take 20 or 30 moves. The Solitaire Games of Skill program also allows the player to flag all the cards of a given suit. This allows the player to more easily assemble an entire suit of cards in one column for the purpose of removal. If a complete suit of cards is available to be removed from the game, the cards should not necessarily be removed. It might be better to keep the cards and use them for getting cards in other columns together with cards of the same suit. 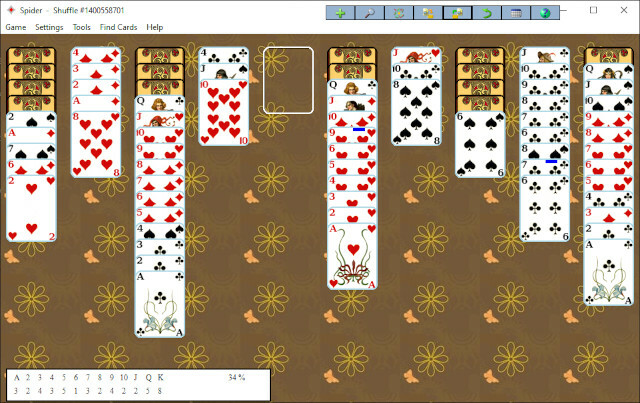 The Solitaire Games of Skill program allows the player to do this while the Microsoft version of Spider and most other software versions of Spider do not. The game Solitaire is also known as Klondike. The tips given here are for the Microsoft version of Klondike which has unlimited redeals with the cards being dealt one at a time. About 70% of Microsoft Klondike games are winnable. It should be noted that the traditional Klondike game does not allow any redeals. The key to winning Microsoft Klondike is uncovering the facedown cards. If the only card left that a faceup card can be built upon is a facedown card in the same column, the game might be lost. For example, the two red nines can only be built on the two black tens in the tableau. If one of the red nines is already built on a black ten and the other black ten is a facedown card under one of the nines, the game is lost unless one of the nines can be moved to a foundation. Do not build with cards from the hand or wastepile unless they are being used to uncover a facedown card. Otherwise you might create a potential block to winning as described in the example above. Before doing any building you might want to go through the hand cards to see what cards you have that can be used to uncover facedown cards. This can be a tedious process requiring a good memory or the writing down of what cards are available. The version of Klondike called Klondike Garden in the Solitaire Games of Skill program makes the procedure painless by spreading out the hand cards so that the player can see all the hand cards at a glance. The hand cards are also sorted by rank and suit for the player's convenience. Also every hand card is available at any time. This might seem to be relaxing the rules too much. But with an unlimited number of redeals, every card can be seen and accessed at any time anyway. Having all the hand cards visible, sorted, and accessible at the same time merely makes the card manipulation easier and reduces the demands on memory. Try to uncover facedown cards from the highest columns first since potential blocks in the layout which could cost you the game are most likely here. Do not build cards on foundations unless doing so helps to uncover a facedown card. Not building the cards on foundations allows other cards to be built upon them on the tableau. FreeCell can be won over 99% of the time. As for Spider, making spaces in the tableau is critical. In trying to make a space in the tableau, find the column which has the most cards which can either be built on the foundations or the tableau. Then remove as many cards as possible from that column. If after this you are blocked, start the game over with removing cards from the column which has the second most number of cards that can go on the foundations or tableau. Repeat the process with untried columns which have the highest number of buildable cards until you are not blocked. If a card can go on a foundation and is in sequence, see if the other card with the same rank and color is available. If it is available, you might be able to place the first card on a foundation and then put the other card in its position thereby possibly freeing up a cell or tableau space. Try to avoid putting kings in cells since kings cannot be built on other cards. If possible cards should be built on the foundations evenly. This avoids problems when building cards on the tableau.